As we go about each day, all things seem to be below the sky, but as we look heavenward, we see the beauty that transcends this hectic world of our own creation. This spruce bough of needles and cones seems to reach upward toward a more perfect world of God's creation. Let us resolve to enjoy the beauty of the Lord's handiwork while protecting and preserving it. It might seem strange to refer to a spruce tree sending valentine cards or messages to her children, but it really isn't when we take a closer look. 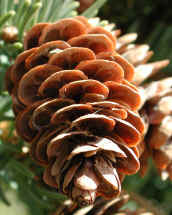 The seeds and pollen of the spruce are contained within the cones, and when the cones open, the seeds are dispersed to begin new spruce trees. The spruce's valentine message for each of her children (seeds) are written on the underside of each scale or bract in the form of our traditional valentine heart. Another of God's wonders to behold! The bright morning sunlight this early spring day highlighted this cluster of cones that had weathered the winter. I couldn't pass them by without taking their picture. One of the interesting things about photography is that we often get some pleasant surprises when we view the images. 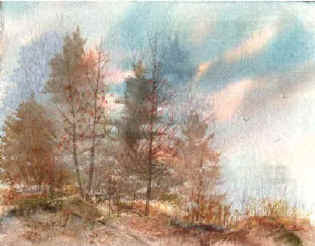 Such was the case here, where the background looks like one painted by an Impressionist Artist. Obviously, they, too, captured the work of the Master Artist, God, who created all things.